Since finishing out his contract with the Royals, veteran outfielder Alex Rios has remained conspicuously absent from the rumor mill. And with nearly a month of the season in the books, he has yet to sign. But the 35-year-old isn’t necessarily retiring, per Jon Heyman of MLB Network (Twitter link). Rios had offers to play for teams, says Heyman, but has held out for a “significant role.” Of course, it seems unlikely that such an opportunity will suddenly present itself while Rios waits at home — particularly since he slashed a meager .255/.287/.353 last year — so it may well turn out that we’ve seen the last of him in the majors. The Cubs have placed catcher Miguel Montero on the 15-day DL to give him a chance to rest his back. Expectations are that Montero won’t be out for long, and he says that he believes the issue stems from a chronic bulging disk, via Gordon Wittenmyer of the Chicago Sun-Times (Twitter link). Chicago has gone with Tim Federowicz to pair with David Ross for the time being. As Jesse Rogers of ESPNChicago.com tweets, the veteran call-up is likely to get a fair bit of playing time; Ross, after all, has been a career reserve and is in his final season. The 28-year-old Federowicz didn’t see any major league action last year after a four-year run with the Dodgers, but has been off to a hot start at the plate at Triple-A-. The Reds are on the verge of getting some much-needed rotation help, writes MLB.com’s Mark Sheldon. Right-handers Homer Bailey and Anthony DeSclafani are each nearing the end of their minor league rehab assignments, as is left-hander John Lamb, who tossed eight innings in a rehab outing on Wednesday. Raisel Iglesias and Brandon Finnegan figure to remain in the rotation regardless, but Alfredo Simon and Jon Moscot could find themselves on the outside looking in, Sheldon notes. With righty Robert Stephenson and left-hander Cody Reed also on the precipice of MLB readiness, the Cincinnati starting unit could see a significant amount of turnover, which could have some positive trickle-down effects into what has been a dismal bullpen so far in 2016. The Royals like Alex Rios, but they won’t be bringing him back in 2016. The team is “said to be” at it’s budget and they will instead go with internal options, Jon Heyman of MLB Network tweets. The team’s plan will be to use Paulo Orlando, Jarrod Dyson, and others in the outfield. The Royals held a mutual option on Rios’ contract that could have paid him $12.5MM for the 2016 season but, as expected, the team opted instead to pay him a modest $1.5MM buyout. Rios, a Scott Boras client, had one of the worst offensive seasons of his career, hitting just just .255/.287/.353 in 411 regular season plate appearances. The 35-year-old also added four homers and nine steals. The outfielder may have been held back by a broken hand suffered in April of last year, though he still produced a decent sample size of 105 games. Rios signed with the Royals in December of 2014 after reportedly blocking a trade that would have sent him to KC that summer. It has also been reported that the veteran turned down a two-year offer from the Mariners last offseason, choosing instead to sign a one-year deal with the Royals. Rios apparently wanted to play for a winner more than he wanted a two-year guarantee, so he might not have any regrets about his decision today as he dons his World Series ring. The Royals have been told by Alex Gordon’s camp that they have “no chance” to re-sign their franchise cornerstone as things currently stand, reports Jon Heyman of CBS Sports. Gordon’s camp is seeking a contract that will pay him upwards of $20MM per season, and Heyman hears that Kansas City has only offered four years, noting that Jim Bowden reported at ESPN that the annual value of said offer is believed to be in the $12-13MM range. With their chances of retaining Gordon looking slim, the Royals have begun to explore the market for alternatives, writes Heyman, including Denard Span, Gerardo Parra, Austin Jackson and another player who was with Kansas City in 2015 — Alex Rios. Each of those players, with the exception of Parra, is a client of agent Scott Boras, with whom the Royals have negotiated a number of deals in recent seasons. Span, coming off hip surgery, is said to be hosting a showcase for interested on teams on Jan. 8 next month, while Parra reportedly already has three-year offers in hand but hopes to land a fourth year. Jackson and Rios have both been largely absent from the rumor circuit this offseason. Each is coming off a relatively disappointing year, though Jackson was more productive than Rios both at the plate and in the field. Heyman also discusses Kansas City’s ongoing search for rotation help, noting that while lefty Wei-Yin Chen sits atop the team’s wish list, but they won’t go to six years for him or offer the five-year, $100MM contract that Chen is reportedly seeking. (I’d personally expect Chen and Gordon to ultimately command relatively similar contracts, so it stands to reason that both would be out of the Royals’ price range.) Heyman also mentions Scott Kazmir and Yovani Gallardo, each of whom has previously been linked to Kansas City. He also, however, adds Ian Kennedy’s name to the list of players the Royals like. The 31-year-old Kennedy hasn’t seen his name come up in many rumors this winter. He got off to a dreadful start in 2015, logging a 7.15 ERA through his first eight starts of the season. However, from June 1 moving forward, Kennedy righted the ship and recorded a 3.41 ERA with a 137-to-38 K/BB ratio in 129 1/3 innings across 22 starts. Though many were surprised to see Kennedy reject a qualifying offer — and that factor does figure to impact his market somewhat — he’s made at least 30 starts each season dating back to 2010, averaging 196 innings of 3.88 ERA with 8.4 K/9 against 2.9 BB/9 in that time. As a fly-ball pitcher that is susceptible to home runs, Kansas City’s Kauffman Stadium would seem, on paper, to be an excellent fit for Kennedy. Not only does the stadium have spacious dimensions, Kansas City’s incumbent center fielder, Lorenzo Cain, is among the game’s premier outfield defenders. And Jarrod Dyson, who could see a more regular role in the outfield corners next season, has registered outstanding defensive ratings in his limited role in previous seasons. Fresh off of their World Series triumph, the Royals will open their offseason by bidding adieu to outfielder Alex Rios and righty Jeremy Guthrie. The players officially became free agents today, per an MLBPA press release. As had been expected, Kansas City declined its mutual options over both, Andy McCullough of the Kansas City Start tweets. Rios’s option was valued at $12.5MM, with a $1.5MM buyout, while Guthrie will receive a $3.2MM buyout on a $10MM option. Rios, 34, had a down year after joining the Royals last winter as a free agent. He slashed just .255/.287/.353 in 411 plate appearances, swiping nine bases and contributing four home runs. Guthrie, on the other hand, came to the Royals via trade and then re-signed before the 2013 season. His deal was restructured last January to defer some of his 2014 salary back to the end of the end of the deal, with the mutual option and buyout accomplishing the task. The 36-year-old struggled to a 5.95 ERA in 148 1/3 innings this year, allowing a league-high 29 home runs in the process. That performance eliminated any possibility that the mutual option would be exercised. The Cubs’ season is now over, but they enjoyed a strong season overall, and the successes of their young hitters can be a double-edged sword for players further down in the system, Cubs player development executive Jason McLeod tells Gordon Wittenmyer of Baseball America. “I said, ’You can look at it two ways: You can say, those guys aren’t much older than me. I have no chance. Or you can look at it and say look how they did it: If you perform they’re going to give you the opportunity,'” says McLeod. Wittenmyer notes that it might be tough for current Cubs prospects to endure the typically slow path through the minors to the big leagues now that they’ve seen players like Kris Bryant and Kyle Schwarber rocket to the Majors. “Kris and Kyle have warped even my sense of where (other prospects) should be sometimes, just with how fast they exploded through the system,” says McLeod. Here are more quick notes from around the big leagues. The Royals’ recent run of success — which continued yesterday as they advanced to the World Series for the second consecutive year — has been powered in large part by their 2010 trade of Zack Greinke, the Associated Press writes. That deal brought back both Lorenzo Cain and Alcides Escobar, the last two ALCS MVPs. Also included in that trade was Jake Odorizzi, who helped bring back Wade Davis, who finished last night’s game. Another Royal, outfielder Alex Rios, turned down a two-year deal with the Mariners last offseason to take a one-year deal with Kansas City, Jon Morosi of FOX Sports tweets. That’s interesting, because Joel Sherman of the New York Post reported last December that Rios had used his no-trade clause to nix a deal to the Royals the previous July after the Royals wouldn’t pick up his option as a condition of the deal. He ended up playing out the season with a non-contending Rangers team. Perhaps watching the Royals in the playoffs last season caused Rios to change his mind about what he wanted. 11:24am: GM Dayton Moore says that the expectation is Rios will only miss three to six weeks of action, though it is too early to establish a precise timeline, McCullough reports (Twitter links). Dyson and Orlando will indeed share right field for the time being, Moore adds. The club may replace Rios on the roster with another pitcher. 10:50am: Royals outfielder Alex Rios fractured his left hand in yesterday’s action, Andy McCullough of the Kansas City Star reports on Twitter. It is a non-displaced fracture, MLB.com’s Jeffrey Flanagan tweets. There is no timetable for his return as of yet, though obviously a DL stint will be in order. Rios’s injury comes as a fairly significant disappointment for a Kansas City club that is off to a 7-0 start. Rios, 34, has played a big role in that effort, slashing .321/.345/.464 in his first 29 plate appearances while contributing a home run and two stolen bases. Signed to a one-year, $11MM contract out of free agency, the veteran represents a significant portion of the team’s payroll. Fortunately, the Royals do have a capable replacement on hand in Jarrod Dyson, a rangy outfielder and highly productive baserunner. Despite below-average batting lines and less than 300 plate appearances in each of the last two years, Dyson has racked up 5.6 fWAR and 4.4 rWAR over that span. Of course, the team has been able to maximize his value by limiting his exposure to left-handed pitching. Right-handed-hitting rookie Paulo Orlando is also on the active roster, and could share time with Dyson in right. Given the internal options and the teams payroll restrictions, to say nothing of Rios’s still-uncertain timeline, a significant outside addition seems unlikely at this point. Of course, hand injuries can be trouble for hitters, so the progress of Rios will be something to keep an eye on as the season progresses. The Blue Jays, Athletics, Cubs, White Sox and Angels are interested in Stephen Drew to play second base but don’t want to pay his $9MM-$10MM asking price, Sherman writes. There’s concern that Drew’s poor 2014 season marks the beginning of a serious decline. “Fine, you want to say June and July [last year] were spring training for him, well, how about August or September? There was never a time in which he looked like a major league hitter,” says one executive. The Yankees could have interest in him, but want to commit to Didi Gregorius at shortstop and could have concern Drew would provide an easy distraction from those plans, even if he’s signed as a second baseman. Earlier this month, we guessed Drew would get a one-year, $7MM deal. 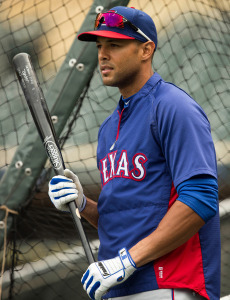 The Royals signed Alex Rios this offseason even though Rios rejected a trade to Kansas City last summer, Sherman says. The Rangers tried to trade Rios to the Royals, but Rios requested that Kansas City exercise his 2015 option as a condition of the deal. The Royals said no, so Rios used his no-trade clause to stop the trade. Rios thus spent the entire season with the Rangers, refusing a chance to join a team in the midst of a playoff race. There have already been rumors of the Padres trading Wil Myers to Philadelphia in a Cole Hamels deal, and Sherman writes that San Diego would, in fact, consider dealing Myers, who they might feel isn’t good enough defensively to handle center field. FRIDAY, 2:05pm: The Royals officially announced their deal with Rios, which includes a mutual option for 2016. That is worth $12.5MM, tweets Chris Cotillo of SB Nation. MONDAY, 7:10pm: The Royals have agreed to a one-year, $11MM deal with outfielder Alex Rios, Jon Heyman of CBSSports.com reports on Twitter. Rios, a Boras Corporation client, joins Kendrys Morales as veteran additions to the defending American League champs. The 33-year-old Rios spent 2014 with the Rangers, slashing .280/.311/.398 with four home runs 17 stolen bases (being caught nine times in the process). That production landed just below league average, one year after Rios put up a .278/.324/.432 line that rated slightly above the league baseline. Of course, he also swatted 18 long balls and stole 42 bags that season (split between the White Sox and Rangers). Now another year removed from his excellent 2012 campaign, Rios also slid in the baserunning and defensive departments, leaving him valued at just .2 fWAR and .6 rWAR in his 521 plate appearances. A thumb issue ended Rios’s season early and cast at least some slight doubt on his health going forward, though Rios has been a remarkably sturdy ballplayer over his long career. Kansas City now has its replacement for Nori Aoki in right field, where Rios has spent most of his career. Both players are similarly aged, but the former is probably a safer option going forward with his consistent on-base ability. Of course, Aoki cannot match the ceiling of Rios, who was worth better than four wins above replacement in recent memory. The club spent a fairly significant sum to take a chance on Rios, going well above the $8.5MM that MLBTR’s Tim Dierkes predicted he would land. Rios joins a recent group of corner outfielders departing the market, leaving players like Michael Morse, Colby Rasmus, and Aoki as the best players available. Of course, that could add impetus to the trade market, which features a number of big names. Photo courtesy of USA Today Images. With Melky Cabrera off the board, Alex Rios remains on the Mariners’ radar, tweets Bob Dutton of The News Tribune. Cabrera agreed to a three-year contract with the White Sox yesterday, which should pay him roughly $14-$14.5MM per season. MLB.com’s Greg Johns entertains other scenarios (both external and internal) in which the Mariners can fill their vacancy in right field. The Rangers have $10-12MM in financial flexibility remaining; but, because of the health questions surrounding their core players, they could sit on that cash until midseason when they will have had time to gauge what kind of team they really have, according to Evan Grant of the Dallas Morning News. Cleveland.com’s Paul Hoynes wonders if Indians outfielder David Murphy is more of a platoon player at this stage of his career and believes a reader’s proposed trade of Murphy to the Mets for Ohio native Jon Niese would favor the Indians. The White Sox have filled many holes with their high-profile acquisitions this offseason, but right field, second base, third base, and catcher remain areas of concern, opines Jim Margalus of South Side Sox. The Twins have invested heavily in the free agent market this offseason and last because payroll was shed and there’s optimism over the performance of Minnesota’s young core, writes 1500ESPN.com’s Phil Mackey.